Training Videos for Using Balancing the Sword - How Do You Use This Tool? Join the Stacy family for one of their nightly Bible studies using Balancing the Sword. What the Stacy children have to say about family Bible Studies. Practical comments from Doug and Fran Stacy as parents leading family Bible studies. If you would like to submit your own video, please write Grow@BalancingTheSword.com. 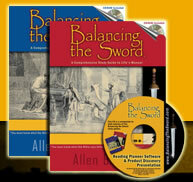 You may be eligible to receive a FREE set of Balancing the Sword books.